Some of the greatest battles ever fought have been sea battles fought on the water which makes up the majority of the surface of the earth. To rule the world you must rule the waves, and to do this you need a strong navy. Some of the most epic sea battles have been fought so a particular force could try to create or expand an empire. 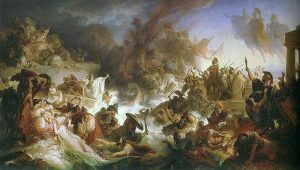 The Battle of salamis was a battle between an alliance of ancient Greek city states and the Persian Empire under king Xerxes. The Persians completely outnumbered the Greeks, and had a major advantage. The battle was fought in the straits between the mainland and an island known as salamis. The Persian army sailed into the straits of salamis, superior in number, and confident in their victory, they charge towards the defending Greeks. Because of the small area they were charging into, large numbers became a liability. The ships got in each others way and became chaotic, the Greeks seized this opportunity, lined up their ships and won the battle. Even though the Persian’s had possibly 800 more ships, the Greeks won a decisive victory. The battle of Red Cliffs is one of the most amazing Chinese sea battles of all time. It has been called the largest sea battle in history. The battle was fought between the warlord Cao Cao from northern Chin, who is said to have had an army of 1 million soldiers, and the opposing warlord’s Liu Bei, and Sun Quan who had only 50,000 soldiers. This was a decisive battle at the time, if Cao Cao had won he would likely end up controlling all of China. During the battle some of the Sun-Liu generals surrendered to Cao Cao, sent ships towards him, however they hadn’t actually surrendered. They tricked Cao Cao, and sent ships filled with oil and straw to burn his entire fleet. This may have been something he could deal with, if he hadn’t chained his ships together, this meant that the fire spread, and destroyed his fleet. Cao Cao retreated, and lost a large portion of his army. This was the final battle of the Roman Republic, and the battle that led to the beginning of the Roman Empire led by Augustus Caesar. It was a battle between Caesar and Mark Anthony who was being supported by Cleopatra. After the battle started it became apparent that Anthony’s ships were too slow, and couldn’t hold out against the faster Liburnians under Caesar’s command. As the battle started going Ceasar’s way, Cleopatra got scared and ran away, Mark Anthony found out and decided to do the same, leaving their forces to be destroyed. Later they both committed suicide when Caesar went to invade Egypt. 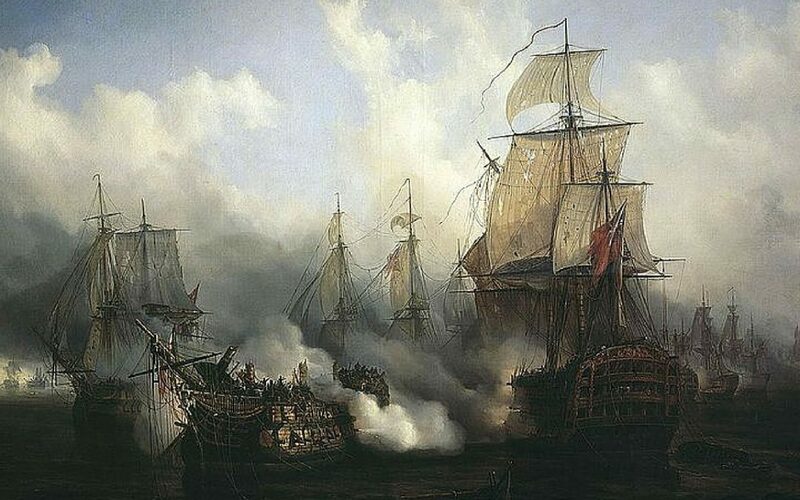 This battle was won by Lord Horatio Nelson one of the greatest commanders of all time, and even managed to win the battle against a much larger force without losing a single ship, but at the cost of his own life. 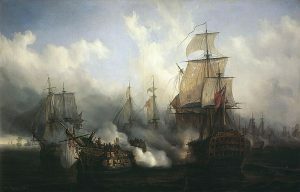 Nelson had around 30 ships, and didn’t lose a single one, the opposition started with advantage but still lost 22 ships. It was one of the greatest sea battles of all time, and meant that the French wouldn’t be able to carry out there plans to invade England. Part of the reason Nelson one was because he used unconventional tactics, the enemies didn’t how to defend against. Nelson was unfortunately shot by a musketeer during the battle, and died. In this battle the Athenians who were facing off against the Spartans were at a major disadvantage. They had also their most experienced, and skilled troops in battle and nothing to fight with but newly recruited sailors who weren’t very experienced. The spar tan’s had much more experienced troops, and so had a major advantage. The Athenians decided to take a risk and tried to use new innovative tactics to defeat the enemy. Amazingly this worked, and the Athenians won the battle. The Athenians only lost 25 ships to the enemies 70. 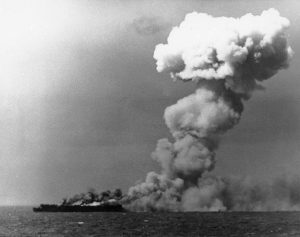 The Battle of Leyte Gulf is one of the largest sea battles of World War Two, and possibly the largest naval battle of all time. It was fought between the allied Australian and American forces, against the Imperial Japanese Navy. The United States invaded an island known as Leyte in 1944 to try and isolate Japan from Islands it had occupied in south east Asia. Japan sent a large Naval force to stop themselves from being isolated. 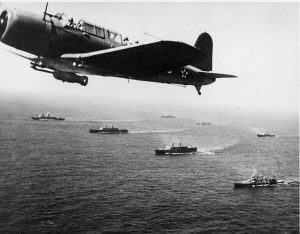 The Japanese sent 67 ships to attack the 300 hundred under US command. This was nearly all of the major naval vessels Japan had, and after they lost they never mustered a force as strong as that again. This victory marked the beginning of Britain’s dominant Navy. 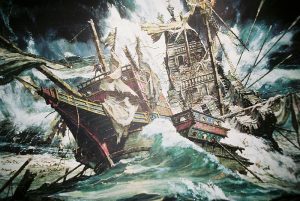 The largest fleet in the world the Spanish Armada was sailing to England. They fought in the English channel were England Ships would have an advantage against the much larger force. The Spanish anchored at Calais and British commander Sir Francis Drake took advantage of this. They filled 80 ships up with flammable material, and sent them in to disrupt the enemy forces, similar to what happened at the Battle of Red Cliffs. This caused the Spanish fleet to go into disarray, and they fled into the open sea in an attempt to escape, but fell right into the English trap, and were bombarded by English artillery. This was a battle between the Holy League, an alliance of Catholic forces et up by Pope Pius V, and the Ottoman Empire who wanted to expand to the Venetian island of Cyprus. This was the last battle in history fought entirely with Galleys. It also halted the expansion of the Ottoman Empire. 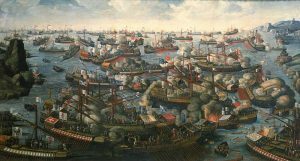 The Ottoman forces began the battle with a grave mistake they mistook Galleasses for merchant supply ships and set out to attack them. Taken by surprise the Ottoman’s lost over 70 ships in this encounter. The Ottoman’s made many more mistakes and eventually lost the battle. The Ottoman’s lost 20,000 men, 187 men, and over 12,000 Christian slaves were freed. 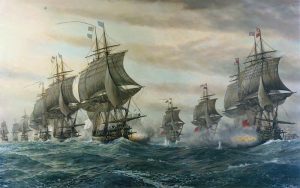 This is also called the Battle of Virginia Capes, and was fought during the American Revolution. On September 5th the British fleet spotted French ships at Chesapeake. They began to get into formation and attack the French, but took to long, and the French managed to get ready for battle. The two sides engaged but couldn’t close in on each other due to bad weather conditions. After a while the French retreated back to Chesapeake, and came back with reinforcements. Eventually the English surrendered, and was a major victory in the American revolution. This victory meant that the English couldn’t reinforce General Lord Cornwallis at Yorktown Virginia, which effectively secured independence for the Thirteen Colonies.